Kuwaiti officials have expressed interest in accelerating development of the country's relatively small petrochemical sector. This would accomplish several goals: boosting the value of Kuwait's crude oil reserves; helping to protect Kuwait's revenues during periods of low crude prices; and boosting Kuwaiti revenues while adhering to OPEC crude oil quota limitations. Historically, Kuwait's Petrochemical Industries Company (KPIC) has mainly manufactured low-value products such as urea, ammonia, and fertilizer for export. PIC is now beginning to move upmarket to production of higher-value products. According to the Kuwait News Agency, PIC may increase production at its polypropylene plant（＊） by 20% to 120,000 tons per year if the market price of polypropylene continues to rise. PIC's primary markets are Jordan, Syria, the United Arab Emirates, Morocco, China and Hong Kong, followed by India, Pakistan and countries in eastern Africa. The EQUATE joint venture, involving PIC and Union Carbide, is the country's largest petrochemical project. The $2 billion industrial complex at Shuaiba, which came online in 1997, includes a 650,000metric-ton-per-year ethylene cracker, two polyethylene units with a capacity of 450,000 metric tons per year, and a 350,000 metric-ton-per-year ethylene glycol plant, all of which are currently operating. (currently 800,000mt/yr of ethylene, 600,000mt/yr of polyethylene, and 400,000mt/yr of ethylene glycol). The complex primarily serves the Asian and European markets. PIC and Union Carbide each have a 45% share in the project, with the remainder owned by Boubyan Petrochemical Company. The EQUATE plant was temporarily shut down by the loss of its ethane feedstock from the Mina al-Ahamdi refinery in June 2000, but has since resumed operation. In April 2001, KPIC approved a $2 billion plan to construct "Equate II," which would be Kuwait's second petrochemical complex, and would produce olefins. ＊　The Polypropylene unit is maintained and operated by Equate on behalf of Petrochemical Industries Company. Kuwait's Petrochemical Industries Company (PIC) said at the weekend it is in talks with major international companies to set up an olefins and aromatics project worth an estimated $3.4-bil. Included in the talks is Dow Chemicals which, when it merged with Union Carbide, assumed its 45% stake in Kuwait's first olefin plant, Equate 1 that it had established in 1997. PIC also holds another 45% stake in Equate 1, with local company Boubyan Petrochemicals retaining 10%. The sources did not name the other companies in talks, but said Dow was enjoying a negotiating advantage because of its involvement in the Equate plant that currently produces 800,000mt/yr of ethylene, 600,000mt/yr of polyethylene, and 400,000mt/yr of ethylene glycol. Aromatics and Olefins II is aimed at expanding Kuwait's downstream hydrocarbon industry. The first project would involve building the country's second olefins plant 'Equate 2' for an estimated $2.0-bil with a capacity production of 850,000mt/yr of ethylene, 450,000mt/yr of low-intensity polyethylene, and 650,000mt/yr of ethylene glycol. The plant would also produce around 70,000mt/yr of propylene to be absorbed by Kuwait's 100,000mt/yr capacity polypropylene factory, after its expansion. The second project would involve an aromatics plant at a cost of around $1.4-bil designed to produce 650,000mt/yr of paraxylene and 500,000mt/yr of styrene. Oil sources said requirements for foreign partnerships in the project would include providing Kuwait with highly developed technological processes, the potential to secure petrochemical markets, and the capability to initially run operations at the plants. Petrochemical Industries Company (PIC) of Kuwait, a wholly owned subsidiary of Kuwait Petroleum Corporation, and The Dow Chemical Company announced today that they plan to construct a new ethylene and derivatives complex in Shuaiba, Kuwait, referred to as Olefins II. "Olefins II would be similar to the existing plants at EQUATE with an 850,000 metric ton per annum ethane cracker and a new world-scale 600,000 metric ton per annum ethylene oxide/ethylene glycol plant using METEORTM ethylene oxide technology," said Mr. Saad Al-Shuwaib Chairman & Managing Director of PIC. Petrochemical Industries Company K.S.C (PIC) was incorporated by an Amiri decree on July 23, 1963. By virtue of that decree, the first chemical fertilizer complex both in Kuwait and the region, comprising of ammonia, urea, ammonium sulphate, and sulphuric acid production was completed in 1966 at the Shuaiba industrial area. Later, the company's industrial capacity was expanded with the addition of a further three ammonia plants and two urea plants. In 1980, Kuwait Petroleum Corporation was formed by an Amiri decree number 6 in that year, as the holding company for the Kuwaiti oil sector and all shares in PIC were transferred to it. ・ To enter into joint ventures for manufacturing products based on feedstock produced in PIC (Kuwait). ・ To enter into the production of a wider range of Petrochemical, which would enable the company to provide all the requirements of its customers in the various markets. ・ Strengthen PIC position and its present globally. Liquid Ammonia 858,000 M.T used as raw material to produce urea fertilizer. This company was established on 5th December, 1979, as a joint venture between the governments of Bahrain, Kuwait and Saudi Arabia, which hold equal shares in its equity. The company's purpose is to produce Ammonia, Urea & Methanol based on natural gas. PIC holds a stake of 33.333% in GPIC ー Bahrain capital of BD 60 million, thus the PIC share amounts to BD 20 million. PIC has a stake of 10% in the capital of Bubyan company which PIC established on 12 February 1995 to encourage Kuwaiti private sector to participate in Equate Petrochemicals Complex project. Bubyan Company has set up future plans to expand investment in petrochemical industries. It has established Bubyan - Sharq Co. in association with the Saudi Sharq plants. Bubyan’s stake in this company is 60%, while the Sharq plants own 40%. This company has built a plant at Mina Abdulla to produce polyethylene bags utilizing PE resin produced by Equate. With 80% of the capital of Bubyan Company invested in Equate Petrochemicals Complex, its financial results depend largely on Equate financial results. During 1999, Bubyan Company participated in several major activities. These include commencement of resin production Jubail Petrochemical Industries Company (JANA) at Jubail Industrial Area of Saudi Arabia, as well as commencing implementation of phase II of the JANA projects, i.e. the Ipocao Hydrin plant. Bubyan Company also participated in the establishment of the United Development Company in Qatar which is the first company specialized in petrochemical projects that depends on petroleum products and natural gas. The company is also specialized in energy, including the production and distribution of electrical power, manufacturing and distribution of petroleum by-products, processing of natural gas, this is in addition to other projects in the UAE. ・ MEGlobal, a 50/50 global joint venture for the manufacture and marketing of merchant monoethylene glycol and diethylene glycol (EG). ・ Equipolymers, a 50/50 global joint venture for the manufacture and marketing of polyethylene terephthalate resins (PET) and the manufacture of purified teraphthalic acid (PTA). ・ Olefins II, a new ethylene and derivatives complex in Shuaiba, Kuwait. ・ A new ethylbenzene/styrene unit in Shuaiba, Kuwait. To form MEGlobal, Dow will sell to PIC a 50 percent interest in its Canadian ethylene glycol assets. MEGlobal will purchase ethylene from Dow. MEGlobal will also market the excess EG produced in Dow's plants in the United States and Europe, and may also market the EG produced by Dow and PIC affiliates. To form Equipolymers, Dow will sell to PIC a 50 percent interest in its PET/PTA business which includes assets in Germany and Italy. Petrochemical Industries Co., a subsidiary of state-owned Kuwait Petroleum Corp., is picking up a 50 percent interest in one plant at Dow's Fort Saskatchewan site, just outside Edmonton, and two more at its Prentiss complex in central Alberta, The Edmonton Journal quoted Dow spokesman Doug Brinklow as saying in a story published Thursday on its Web site. The plants make about 1 million tons a year of ethylene glycol as a raw material for polyester fibers, polyethylene resins and antifreeze. Equipolymers, a 50/50 global joint venture between Petrochemical Industries Company (PIC) of Kuwait, a wholly owned subsidiary of Kuwait Petroleum Corporation and The Dow Chemical Company has received full regulatory approval and has commenced formal operations in the manufacture and marketing of polyethylene terephthalate resins (PET) and the manufacture of purified terephthalic acid (PTA), as a new entity. Equipolymers will serve customers globally and will be headquartered in Zurich, Switzerland. Production facilities include PET and PTA plants in Ottana, Italy, and a PET plant in Schkopau, Germany, as well as a second PET plant in Schkopau, which is expected to start-up by the end of 2004. After the start of the new PET plant in Schkopau, the JV will have PET capacity of approximately 434,000 metric tons. MEGlobalTM, a 50/50 joint venture between Petrochemical Industries Company (PIC) of Kuwait, a wholly owned subsidiary of Kuwait Petroleum Corporation, and The Dow Chemical Company has received full regulatory approval and has commenced formal operations in the manufacture and sale of Monoethylene Glycol and Diethylene Glycol, (EG), as a new entity in the global EG market. Daniel C. Scheid has been named President and chief executive officer of MEGlobal. MEGlobal is headquartered in London, England, with approximately 200 employees worldwide and production facilities in Fort Saskatchewan and Red Deer, Alberta, Canada. MEGlobal serves customers around the world with ethylene glycol, a raw material for the manufacture of polyester fibers, polyethylene terephthalate resins (PET), antifreeze formulations and other industrial products. Kuwaiti companies and individuals will be offered 90 per cent of the shares in a new company which will invest in the petrochemicals industry, the head of the state-owned petrochemicals company said. Saad Shuaib, chairman and managing director of Petrochemical Industries (PIC), said subscriptions for shares in Qurain Petrochemicals Industries will open on Monday. The offer will be for 990 million shares of 100 fils each, making a total of KD99 million ($336.6 million). The remaining 10 per cent of Qurain will be owned by PIC, a subsidiary of Kuwait Petroleum Corp (KPC) which oversees the energy sector in Kuwait, and controls nearly 10 percent of global crude oil reserves. 'This is the largest public subscription in the state of Kuwait,' Shuaib told the news conference. The Kuwaiti government has proposed privatising national airliner Kuwaiti Airways and the telecommunications sectors and parts of its energy sector and is working to open up the banking and aviation sectors to competition. Overall, the privatisation drive has proved to be slow but recent initial pubic offerings for Kuwait's only private-sector fuel marketing firm - which takes over from the government the running of part of the petrol stations - as well as the first private airlines, a no frills carrier, were oversubscribed. Qurain's capital will be used to invest in petrochemical companies such as Equate Petrochemical, a multi-billion-dollar joint venture between state-owned PIC and Dow Chemical, as well as local concerns. Boubyan Petrochemical, a local listed company which owns 10 per cent of Equate, earlier this month sold a one percent stake in Equate for $42 million, with the shares intended to go to Qurain. When it is set up in January or February, Qurain will own six per cent of Equate's capital. Qurain Petrochemical will also make investments in other projects in the sector such as The Kuwaiti Olefins Company (TKOC), Kuwaiti Aromatics Company (KARO) and The Kuwaiti Styrene Company, Shuaib said. PIC produces liquid ammonia, sulphur, fertilisers and polypropylene and holds a 45 per cent stake in Equate, which supplies polyethylene and ethylene glycol to markets in Asia, the Middle East, Africa and Europe. Both PIC and Equate are working on starting up a multi-billion-dollar olefins and derivatives manufacturing complex expected to be completed at the end of 2007. 'The Qurain public subscription is one of the essential methods for implementing the Petrochemical Industries (2001 - 2009) strategic plan aiming to expand petrochemicals activity in Kuwait ... especially in products with big growth such as aromatics, olefins and related products,' Shuaib said. The petrochemical industry in the Middle East eyes decades of growth, and the region will be one of the world's biggest producer of essential petrochemicals by 2005, he said. Subscirptions in Qurain, which close December 16, will be open solely to Kuwaiti companies or individual investors who can express interest in buying a minimum of 1,000 shares and a maximum of 25,000. Qurain will list on the Kuwait Stock Exchange after the company issues its first profit report and the process takes at least a year. Subscribers will pay an additional three fils per share in subscription fees. Boubyan Petrochemical Co. sold a one percent stake in EQUATE Petrochemical Co. for $42 million, with the shares intended to go to new company al-Qurain Petrochemical Co., Kuwait's bourse said on Wednesday. 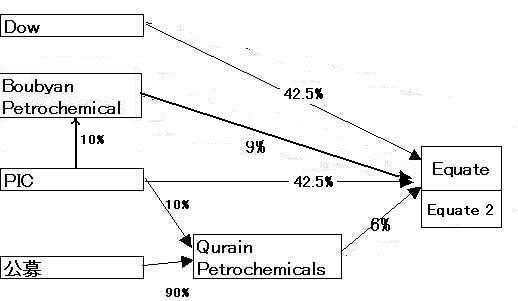 The one percent of shares in EQUATE, a joint venture with Dow Chemical Co. which supplies polyethylene and ethylene glycol to markets in Asia, the Middle East, Africa and Europe, will be placed in a special account at a local bank until the establishment of Quarain Petrochemical, or until 31st of March 2005, whichever comes first, the statement said. Shares in Qurain Petrochemical should be open for public subscription soon. When it is set up, Qurain will own 6 percent of EQUATE's capital but will make investments in other petrochemical projects in the Gulf Arab state, which sits on about 10 percent of the world's petroleum reserves. "Boubyan Petrochemical has signed a conditional sale deal for the equivalent of one percent of EQUATE Petrochemical's capital (or 10 percent of Boubyan's stake in EQUATE) for $42 million, based on the new evaluation for EQUATE Petrochemical," the Kuwait Stock Exchange said in a statement. State-run news agency KUNA said an independent evaluator hired by EQUATE had put the company's fair value at 1.2 billion Kuwaiti dinars ($4.2 billion). EQUATE was first set up in 1995. Boubyan owns 10 percent of the EQUATE joint venture, which is 45 percent held by Union Carbide Corp., now a subsidiary of Dow Chemical, and 45 percent by government-owned Petrochemical Industries Co. (PIC) of Kuwait. If Qurain Petrochemical is set up, Boubyan will book a profit of 9.6 million dinars ($32.6 million) from the EQUATE deal, the bourse added. But if Qurain Petrochemical is not established, Boubyan will not make any profit and it stake in EQUATE will revert back to 10 percent, it added. KUNA said the EQUATE evaluation report noted Boubyan's investment in EQUATE had risen to 123.5 million dinars from 65.8 million dinars. Boubyan Petrochemical's main activity is investing in industrial projects, particularly petrochemicals. EQUATE in 2003 posted a net profit of $276 million, up 160 percent over 2002. Meanwhile, Boubyan Petchem's profit for the year ended April 30 nearly doubled to 12.45 million dinars ($42.3 million). The stake sale announcement was made before the market close on Wednesday, the end of the trading week in Kuwait. Shares in Boubyan Petrochemical finished down 20 fils, or 2.6 percent, at 750 fils, putting it near the top of the losing column. The share has year highs and lows at 780 fils and 395 fils, respectively. Meanwhile, the main bourse index grouping some 110 stocks rose 19.50 points, or 0.32 percent, to 6,174.10. Petrochemical Industries Company (PIC) of Kuwait, a wholly owned subsidiary of Kuwait Petroleum Corporation, and The Dow Chemical Company today entered the next phase in the construction of their new ethylene and derivatives complex in Shuaiba, Kuwait. Under the patronage of His Excellency Sheik Ahmad Fahed Ahmad Al Sabah, Minister of Energy and in the presence of His Excellency, Sheik Ali Abdullah Al Salem al Sabah, Governor of Al Ahmadi, Members of Parliament, and delegates from Oil, Energy and Economical sectors and the Private sector represented by Boubyan, Mr. Saad Al-Shuwaib, Chairman and Managing Director of PIC and Andrew N. Liveris, President and Chief Executive Officer of Dow, laid the foundation for the construction phase of the project, also referred to as Olefins II. Kuwait, China signed on Monday a Memorandum of Understanding (MoU) to a build a refinery and a petrochemical plant in China's Kuan Shu province as a joint-venture by both nations. While saying it is too soon to speak about the project's details, he said the refinery's capacity would range between 200,000 to 400,000 barrels-per-day (bpd). Kuwait and China signed an agreement for the construction of a refining and petrochemicals complex in China at an estimated cost of 5 bln usd, officials said. The complex, expected to process crude oil from Kuwait, will be established in Guangdong province in China and is planned to be onstream in 2010, Kuwait's energy ministry said in a statement. The memorandum of understanding for the project was signed by Kuwait's Energy Minister Sheikh Ahmad Fahd al-Sabah and a visiting Chinese vice governor, Zhong Yangsheng. Sheikh Ahmad told reporters that the capacity of the refinery will be between 200,000 barrels per day (bpd) and 400,000 bpd. The project will be carried out as a joint venture between China's PetroChina and Kuwait's Petrochemical Industries Company (PIC) and Kuwait Petroleum International (KPI). PIC director Saad al-Shuwayeb told reporters the cost could run at around 5 bln usd. The two countries agreed to invite leading international partners in both refining and petrochemical sectors to participate in the project, the ministry statement said. Prime Minister Sheikh Sabah al-Ahmed al-Sabah visited China last year. The Shaw Group Inc. today announced that its Shaw Stone & Webster unit has been awarded an engineering, procurement and construction services contract by The Kuwait Styrene Company K.S.C. (TKSC), a joint venture between Dow Europe Holding B.V., a subsidiary of The Dow Chemical Company (NYSE: DOW), and Kuwait Aromatics Company K.S.C. (KARO) for an ethylbenzene styrene monomer (EBSM) plant to be built in Kuwait. The plant, which will produce up to 500,000 metric tons per year of ethylbenzene and 450,000 metric tons per year of styrene monomer, will be built within the existing EQUATE complex. The amount of the contract was not disclosed. The new world-scale EG2 unit, with a total capacity of 600,000 metric tonnes per year, is part of TKOC's planned Olefins II ethylene and derivatives complex. It will use Union Carbide's METEOR(TM) ethylene oxide/ethylene glycol process technology. It is scheduled to be completed by the second quarter of 2008. EQUATE Petrochemical Company announced on Monday July 7, 2008, taking over the first process unit of the Olefins II Kuwait Program (OL2K). The EG-2 unit is a critical part of the OL2K Program, also known as the expansion of EQUATE. The capacity of the unit is 600,000 metric tons annually (MTA) of EG. Upon startup, EQUATE’s total EG production will reach about 1.15 million MTA. Kuwait Petroleum Corp and BP held high level talks recently about common interests in potential projects in China that could include a joint-venture partnership in a refinery in Guangdong, KPC deputy chairman Hani Hussein said Sunday. In July 2004 Kuwait and China signed an MOU to set up a duel project in Guangdong -- a 200,000 b/d and 400,000 b/d capacity refinery combined with a petrochemical complex. The Kuwait National Petroleum Co has awarded four of five packages from a tender for the construction of a new 615,000 b/d greenfield refinery to a group of Japanese and South Korean companies for a total of $8.4 billion, the official KUNA news agency reported late Sunday. The first package, for the construction of the main manufacturing units, including three 205,000 b/d crude distillation units, was awarded to an alliance of Japan's JGC and South Korea's GS at a value of $4 billion. South Korea's SK Engineering and Construction was awarded the $2.624 billion second package for the construction of the hydrogen production units, while South Korea's Dailem Industrial Co. was awarded the $1.184 billion fourth package for the construction of a storage tank farm. The $1.12 billion fifth package, for marine utilities, was awarded to South Korea's Hyundai Engineering. Package 3 of the tender, for utilities and offsites, was not awarded. A planned refinery joint venture in southern China between state-owned Kuwait Petroleum Corp (KPC) and Sinopec Corp is expected to cost up to $4 billion above initial estimates, state news agency KUNA cited KPC's head as saying. The Kuwait-Chinese refinery and petrochemical project is expected to cost between $8 billion to $9 billion, Saad al-Shuwaib, Chief Executive of KPC told Chinese magazine Finance and Economy, KUNA reported late on Friday. The refinery will be designed to process 100 percent Kuwaiti crude supplied by KPC, with a capacity of 15 million tons per year, or 300,000 barrels per day (bpd), said KUNA. EQUATE Petrochemical Company announced the completion and successful start-up of its Polyethylene (PE) expansion project. The latest piece of Greater EQUATE increases EQUATE’s overall PE production capacity to 825,000 metric tons annually (MTA) of High Density PE (HDPE) and Linear Low Density PE (LLDPE) resins. Considered one of the world’s leading companies in producing Polyethylene and Ethylene Glycol, EQUATE was established in 1995 and it is presently a joint venture between Petrochemical Industries Company (PIC), The Dow Chemical Company, Boubyan Petrochemicals Company and Qurain Petrochemical Industries Company. It commenced production in 1997 and currently provides markets in the Middle East, Asia, Africa and Europe with high quality petrochemical products. Kuwait may revive plans to build a joint venture refinery in Louisiana after the Gulf Arab state canceled last year a joint venture deal with U.S. petrochemical giant Dow Chemical Co, al-Watan newspaper reported on Wednesday. The joint-venture refinery project in Louisiana would be considered compensation to the U.S. for canceling the Dow project, the paper reported, citing unidentified sources. Kuwait and the state of Louisiana signed in 2006 a memorandum of understanding to add refining capacity in the southern state. Kuwait and Louisiana have signed an initial agreement to study building a joint venture oil refinery in the southern US state. Kuwaiti Oil Minister Shaikh Ali al-Jarrah al-Sabah and Louisiana Governor Kathleen Blanco said, after signing a memorandum of understanding, that the size of the refinery and its cost were yet to be determined. "This MoU establishes Kuwait's strong interest in Louisiana as a viable site for the first greenfield crude oil refinery in the US in 30 years", Blanco said. (Kuwait is studying plans to build a multibillion-dollar refinery and petrochemical plant in south China with PetroChina and recent reports said it may enter into joint venture refining deals in India).